Is classic car investment the answer to an uncertain future? Classic car investment offers a breath of sanity as the world descends into a state of economic and political flux, where uncertainty is a significant threat to an investor’s ability to create and preserve their wealth. The ever expanding shift towards automation, is putting more and more, blue collar jobs under threat. The world is has exponentially changed and emerging markets are now responsible for the world’s continued growth, so expect much higher volatility within markets. We now live in a post-truth world where appeals to belief or emotions far outweigh the importance of facts when shaping public opinion. As a result investors are going to have to pay a lot more attention to the safety of their capital rather than the size of their returns. As money moves at a faster rate within the global economy, the world’s governments have begun calculated efforts to control and monitor the spread of wealth through the OECD’s Common Reporting Standard (CRS). Governments will thus be sharing unprecedented amounts of financial data on their foreign citizens with each other. Wealth movement is being driven by two factors: the demand of the wealthy to move their money into tax havens and the opposing force of governments attempting to institutionalize that process. With such great political uncertainty, the wealthy are facing an ambiguous future with regards to fiscal, economic, and political policy, and as we all know nothing is promised. While the trend towards technologies like driverless cars will undoubtedly create more liveable environments in the world’s key urban hubs over the next decade. It serves as an ominous thought to think that we may very well be standing on the precipice of the end of motoring as we know it today. Will classic cars become the best liquid investments? In 2016 the annual growth in the classic car market proved to be have much slower with a very respectable 9% compared to the total growth of 151% over the past five years, and 458% over the last ten years (see the Knight Frank Classic Car Report 2016 Q1 & Q2). It appears that the classic car market has returned to the hands of the long-term collectors and specialists in 2016, rather than short-term investment collectors who were just in it for a quick return on their classic car investment. 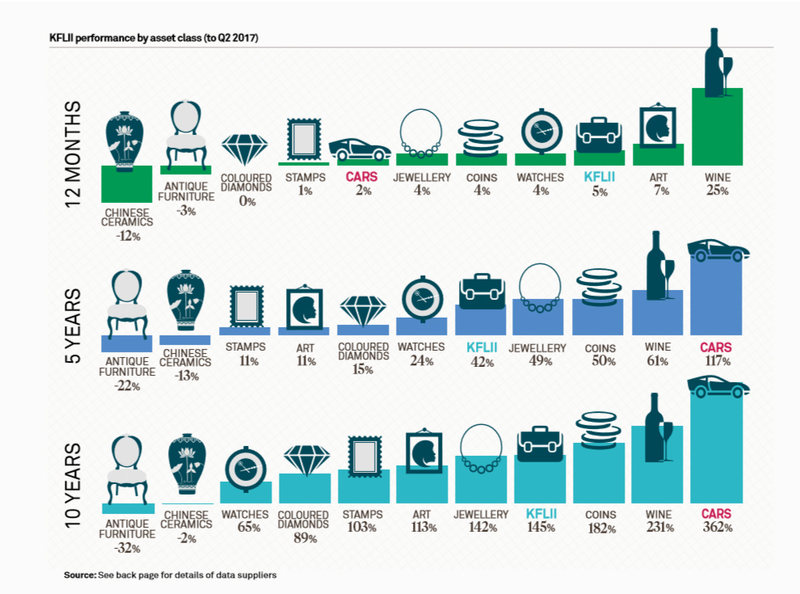 Investment grade wine did finally knock classic cars off the winner’s podium in the 2016 Knight Frank Luxury Investment Index (KFLII), by recording blistering growth of 24%. Wine’s stellar performance was primarily driven by the resurgence of the top Bordeaux chateaux and turbo-charged market environment created by Brexit’s devaluation of the United Kingdom’s pound sterling. Why should you use the long view on classic car investment? In the first quarter of 2017 we only saw a modest 6% growth (see the Knight Frank Classic Car Report 2017 Q1). Classic car buyers have become more reticent leading to lacklustre sell-through rates and number of cars have not fetched their low reserves at some recent high-profile auction sales. Rare cars, both old and more modern are still routinely selling for millions of pounds, euros or dollars, and the not so rare are still selling well through classic car dealers. The slow down in demand for classic cars is actually beneficial for the long-term health of the market. So as the another year draws to a close, you are being faced with a very exciting time to engage and invest in the classic car market because the balance has shifted heavily in favour of the buyer. Expensive European models were the cars in most demand this time last year, but demand has shifted to cheaper US vehicles and buyers are investing in fun of driving a American classic like a ’66 Ford Bronco. The classic car market has a lot of elasticity and it will bounce back and in these rare moments its wise to invest with a long view on the classic car market. Due to strong promotional activity from the big manufacturers who are pushing their heritage in a big way, the market has been cushioned from greater falls. Jaguar and Aston Martin have released continuation models and there has been a big presence from marques like Mercedes at Goodwood and other events. Yet one thing is certain until there are more mobile and tax efficient havens for investor’s money; the classic car market is likely to remain robust and capable of reaching new record breaking peaks. In 2016 the classic car market has shifted from a sellers’ to a buyers’ market and people are becoming more selective. 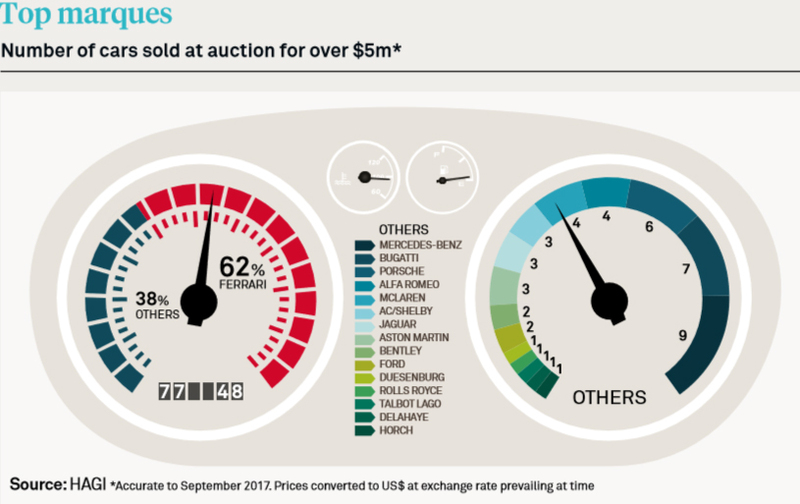 There was a drop of 26% fewer auction sales of cars over US$1m in North America. Yet there still was, a few notable sales such as the Ferrari 1957 335 Sport which became the most expensive car in Euro terms to go under the hammer, when it was auctioned by Artcurial in Paris for €32m. In the US, the annual Monterey sales set new benchmarks when a historic 1962 Shelby Cobra sold for over US$13m through RM Sotheby’s, which made it the most expensive American car to sell at auction for the year. The priciest British car to go under the hammer was a 1955 Jaguar D-type when it fetched almost US$22m. Alfa Romeo set a new record for a pre-war vehicle with the 1939 8C Lungo Spider fetching just under US$20m. 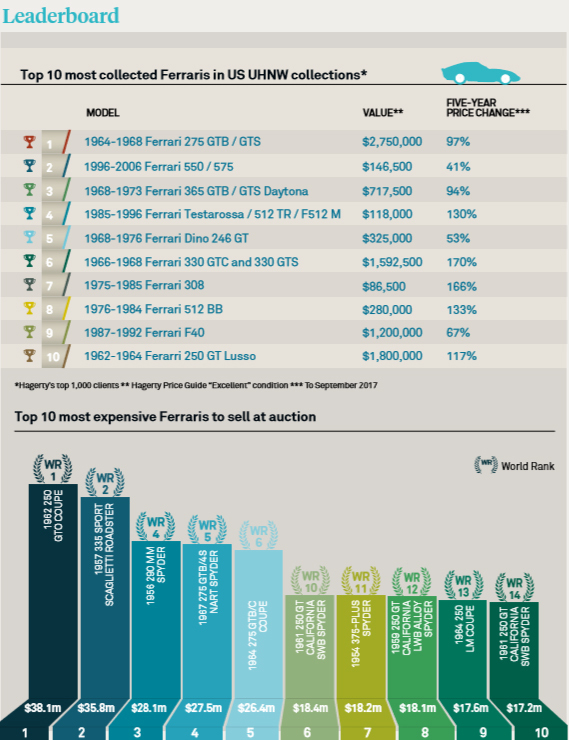 The most expensive car sold last year was a private sale of a 1962 Ferrari 250 GTO, while the exact price was not revealed it did exceed the highest sum ever paid at auction for a classic car and was possibly the biggest sale ever closed (surpassing US$38m for another Ferrari 250 GTO sold by Bonhams). Ferrari’s 70th birthday party may have been spoiled by the slow down in the classic car market but fortunately eight of Maranello’s finest broke the $5m sale barrier led by a record-breaking 1966 275 GTB/C The silver 275, which had a racing pedigree fetched $14.5m at Gooding & Co’s Pebble Beach sale in August 2017, and was the most expensive of version of that particular model to ever go under the hammer. A LaFerrari Aperta, Ferrari’s first hybrid model, made around $10m for charity at RM Sotheby’s Ferrari-only sale in September. 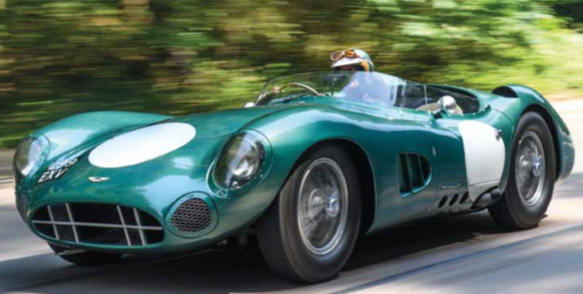 A glorious Aston DBR1, once raced by the now legendary Stirling Moss, sold for over $22.5m by RM at its Monterey sale. It not only set a record for the marque, but also for any British car. McLaren was not to be left out and set a marque record for a F1 for $15.6m in Monterey by Bonhams. Collectors are captivated by the story behind their classic; and they need to be absolutely assured of the provenance and attribution of the car, when they are investing in motoring history. So it’s always a wise upfront investment to pay for the time and expertise of a marque specialist, or an expert from the manufacturer. VCI always requests documentation, such as bills of sale, legal certificates or any records that may be held by the original manufacturer when we manage your classic car investments. We ensure that there is no outstanding finance on the classic car, to negate any competing claim for ownership. We pride ourselves on offering you full insurance coverage right to the delivery at your door, or till the moment you have ownership transferred of your classic. VCI’s transport logistics will save you both time and money when taking delivery of your car.